Have you always been drawn to the mathematical rigor of physics? Yet found that the most interesting problems were those in the purview of biology? Believe it or not, you can have it both ways. A few researchers have always plied their trade at the interface between physics and biology. The ranks of such biological physicists are now growing at a rapid and accelerating rate. In this post-genomic age, the tools of physics will be needed to understand the gestalt of life, i.e. how the whole is greater than the sum of its parts. If working at the interface interests you, take a look at the ongoing projects in the lab. The central theme of biophotonics is the interaction of biological systems with light. Our group is involved in research projects that investigate the physical mechanisms of laser ablation and laser-microsurgery. We also use these tools to probe the mechanics of biological systems. 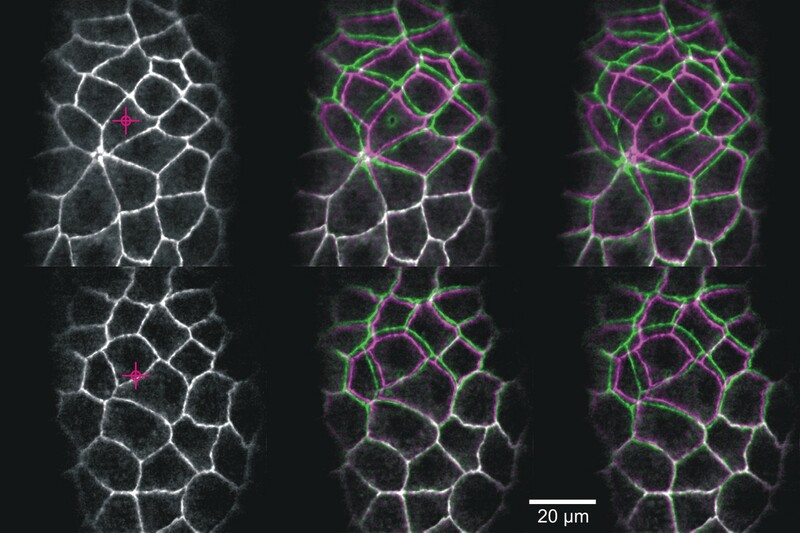 Laser microsurgery of an embryonic epithelium: magenta = cell edges before ablation; green = cell edges after ablation; white = edges that have not moved. Imagine an apparently structureless, quiescent lump of material that is suddenly “activated” and begins a dramatic series of deformations. Ultimately, these deformations produce a complex and highly-organized 3D object. How would you determine the mechanisms driving such self-assembly? This is exactly what takes place as fruit fly (Drosophila melanogaster) embryos develop into free-crawling larvae. 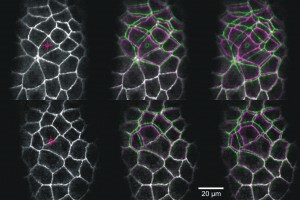 As these embryos develop, forces generated within the embryos drive the cell shape changes and movements of morphogenesis. Our colleagues in biology have made huge strides in understanding the genetic program of development, but physicists are needed to unravel how this program unfolds through the non-linear continuum mechanics of cells and tissues. The tools we use to investigate these mechanics include confocal microscopy and laser-microsurgery. We also do extensive computational modeling (viscoelastic finite elements and cellular Potts models) to match models with the experiments. See this Vanderbilt Explorations article or this one or follow this link to learn more . . .
We use laser-microsurgery extensively to probe morphogenetic mechanics, but can we make it a quantitative tool? To do so, we need to have very good grasp of the ablation-associated plasma and cavitation dynamics. These dynamics have been well-studied in simple model systems like distilled water – an excellent first step – but biological systems obviously differ from water in important ways. We are studying the plasma and cavitation dynamics observed during pulsed laser microsurgery in a model biological system (fruit fly embryos) and have found important differences in the dynamics observed in water and those observed in the fly embryos (i.e. in vivo). One of these – physical constraint of cavitation bubbles by the biological matrix – was anticipated by previous investigators. The other – a reduction in the plasma threshold due to biological molecules that could serve as sources of seed electrons at low intensities – was not. Physicists are generally very good at sweeping away extraneous details; however, work at the interface with biology is often criticized for broadly extrapolating from measurements in systems that are just too simple. In this case, we have made physical measurements on the fully complex in vivo system, compared the results to the very simple system of distilled water, and characterized the important ways that these two differ. In a recent extension of this work, we’ve optimized techniques for holographic laser microsurgery – i.e. using a phase-only spatial light modulator (basically a digital hologram) to focus the laser to a user-designed pattern and ablate multiple locations with a single pulse. This will become an effective tool for probing a cellular mechanics and it also opens up interesting new physics in the interactions among closely spaced cavitation bubbles. See this article in Biophotonics, this one in Photonics Spectra or follow this link to learn more . 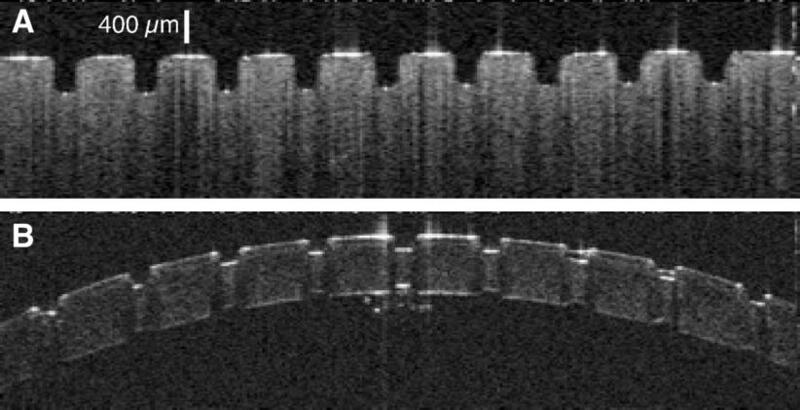 . .
OCT images of ablation craters in (A) gelatin and (B) cornea created by the Raman-shifted alexandrite laser. The goal of delicate neurosurgical and ophthalmic procedures is often to remove or ablate a defined volume of tissue while leaving surrounding tissue undamaged. There are several laser systems that can achieve this task, including mid-infrared Free Electron Lasers (mid-IR FELs). The Vanderbilt FEL was in fact used in several successful human surgeries. Despite this success, FELs are unlikely to ever find widespread use in patient care – due to both cost and size constraints. One of the major challenges in the field has been to translate the surgical successes of mid-IR FELs to cost-effective, compact, and dedicated medical laser systems. This challenge became even more pressing with the demise of funding for the Department of Defense Medical FEL Program and decommissioning of the Vanderbilt FEL. My group has taken the perspective that meeting this challenge requires a deeper physical understanding of mid-IR tissue ablation. 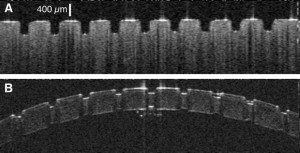 We have thus investigated the details of tissue removal during mid-IR laser ablation – including the use of molecular spectroscopy (FTIR, micro-Raman, 13C-NMR, scanning electron microscopy, as well as UV and vibrational circular dichroism) to unravel exactly how tissue structural integrity fails – and found that the failure modes could be influenced by laser wavelength, pulse structure and spot size. We took these insights to a willing and able industrial collaborator, Light Age Inc, who designed and fabricated a prototype Raman-shifted alexandrite laser that operates in the mid-IR’s 6-µm wavelength region, with pulsewidths in the 10 ns regime and pulse energies of several mJ. Initial experiments showed that this laser ablates excised soft tissues as cleanly and efficiently as the FEL. We are now collaborating with Dr. Karen Joos in Ophthalmology to gear up for surgical trials in live pigs. Follow this link to learn more . . .
Finite-element model of epithelial wound expansion. When we use laser-microsurgery to create wounds in fly embryos, those wounds heal in a matter of minutes! Such wound healing is both a genetic and a mechanical process. Complete understanding requires both perspectives. Thanks to support from the Human Frontier Science Program, we began an international collaboration to investigate embryonic wound healing with Antonio Jacinto’s cell biology group at the Instituto de Medicina Molecula in Lisbon, Portugal and G. Wayne Brodland’s civil and mechanical engineering group at the University of Waterloo in Ontario, Canada. This collaboration has yielded important insights into the initial mechanical response of epithelia to small laser wounds (including a very close matching of finite-element models and experiments), the control of epithelial tension by RhoGEFs and the impact of such control on wound response. This collaboration has also led to the development of Video Force Microscopy (led by Brodland’s group). This tool uses finite-element models in an inverse mode to analyze video microscopy images and directly infer the forces present in a living cell sheet. See this highlight from the HFSP website or this one or follow this link to learn more . . .